Representatives, headed by high school senior Addie Bjornson (wearing the dark jacket), of SOTABots attended the March meeting of the Projects Committee for the Rotary Club of Tacoma #8. The Rotarians were awed by the enthusiasm and determination of the students. Student team members learn problem solving skills designing, constructing and programing high-performing robots. The Rotary club donated items to their auction fundraiser and a group of four attended the event. Representatives headed by Addie Bjornson (wearing the dark jacket) of SOTABots attended the March meeting of the Projects Committee for the Rotary Club of Tacoma #8. 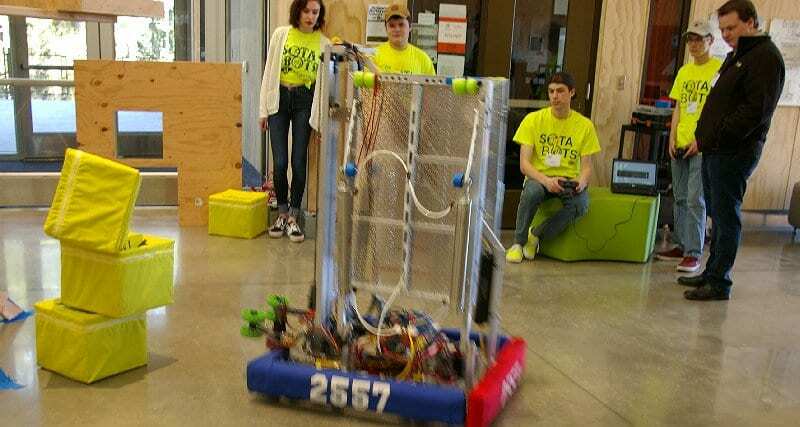 The SOTABots benefit included a light lunch (past award trophies were laid out every four feet), benefit auction, and a preview of their 2018 Competition Robot. Although only a few years ago robots were something out of science fiction stories, today they are becoming more and more a part of our lives. My wife and I along with two of our grandchildren attended a local robotics competition in Covington featuring SOTABots. Teams were there from all over Western Washington. The dedication and seriousness of each face-off was intense. You could feel it in the air and see it on the faces of viewers and participants as well. I can only imagine the energy level in Houston when “tens of thousands of students compete on the world stage.” Good luck SOTABots!